Of all the home automation products out there, smart lighting is the one that often makes the most sense. After all, who hasn’t wished they could turn off their home's lights from bed last thing at night, or have them turn on automatically when they come home? Now one of the leading suppliers of LED light bulbs, Ikea, is getting into smart lighting in a big way. The home furniture company is releasing a number of smart LED bulbs which you’ll be able to install into your existing light fittings, and control either with an optional remote or an app on your phone. Like Philips Hue, the kit requires a wireless gateway if you want to control the system using the app. The Trådfri app will allow you to group bulbs into groups, and can be used to put the bulbs on timers to have them turn on and off at specific times. Using the system you’ll be able to cycle through various brightnesses and warmths of lighting from a dim yellow hue (better for late at night) to a bright cold blue (better for work environments and mornings), although there aren’t any of the color-changing options as seen in the more premium Philips Hue bulbs. Ikea is also using its furniture-building heritage to great effect by providing ‘light doors’ that can be installed directly into existing cabinets. Floor and ceiling mountable lights are also available. There are four main packages of bulbs at launch. At the cheapest (£15) end you get a single light bulb and a magnetic remote that can scroll through two different light settings. For £25 you get a single bulb and a motion detector. Springing for the £29 kit replaces this motion detector with a more advanced remote that can change both the warmth and brightness of the light. You’ll have to spend a full £69 if you want to get the gateway that allows you to control your home lighting with an app. This kit will also get you two light bulbs and the more advanced remote outlined above. 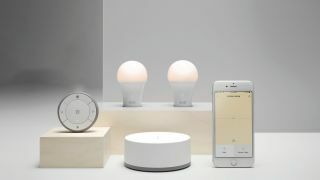 From this initial announcement it looks like Ikea has covered most of the bases in terms of what you need for a smart lighting system, although it’s unfortunate that you have to get the more expensive kit to be able to control the lights with your phone. We’ll also be interested to see how well the system scales up when you start adding more Ikea bulbs. We can’t wait to get our hands on the lighting kit for ourselves, which Ikea states will be available starting from this April. Check out our full review of Philips Hue, the current leader in smart lighting.